It's been a long time since I did a What I Ate Wednesday...and as you can tell not much has changed! 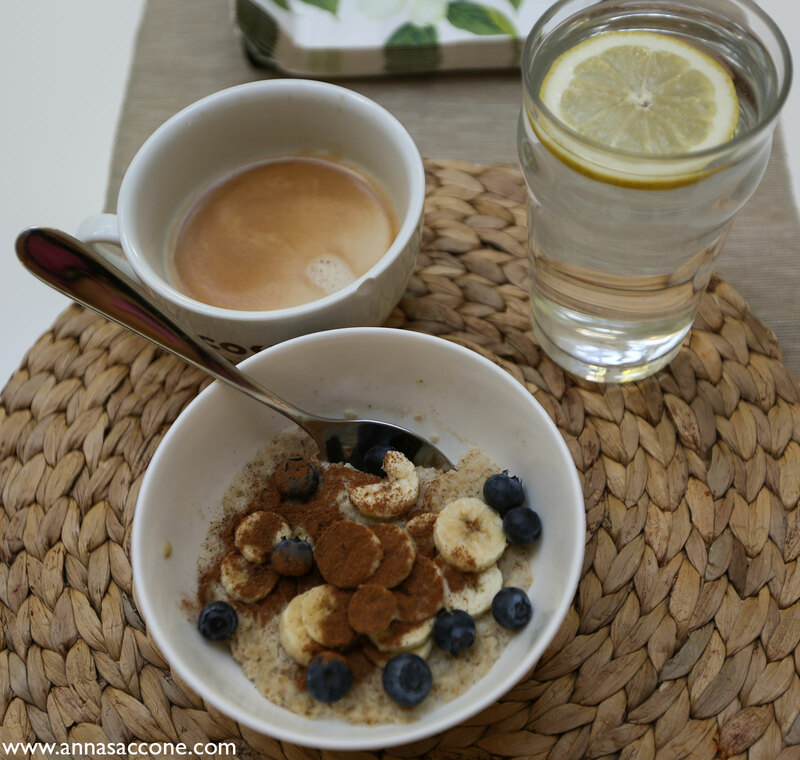 Here's what I had for breakfast - porridge oats with almond milk, 1/2 banana, blueberries and cinnamon! I also had a black coffee and pint of water with lemon. For lunch I had a poppy seed roll (fresh from the bakery!) 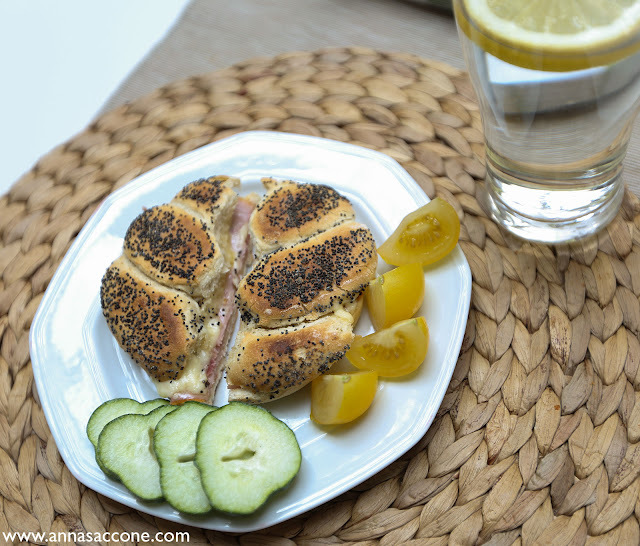 toasted with ham & cheese along with some yellow tomatoes and a rather odd looking cucumber...hahaha! I also drank another pint of water with lemon. 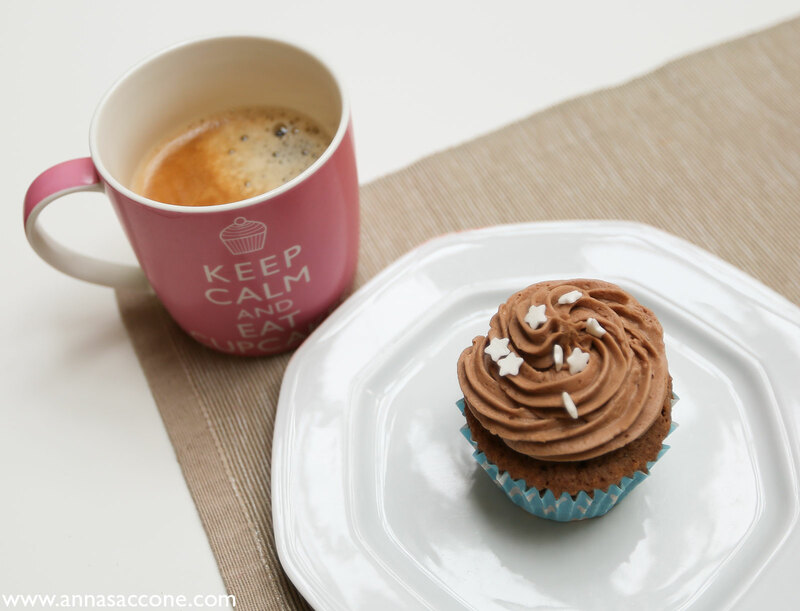 Later that afternoon I had a little treat, as my friend Laura was over & we sampled some of my chocolate & coconut cupcakes that I baked over the weekend! They are SO good especially because they contain white chocolate chips! I had this with a black coffee. 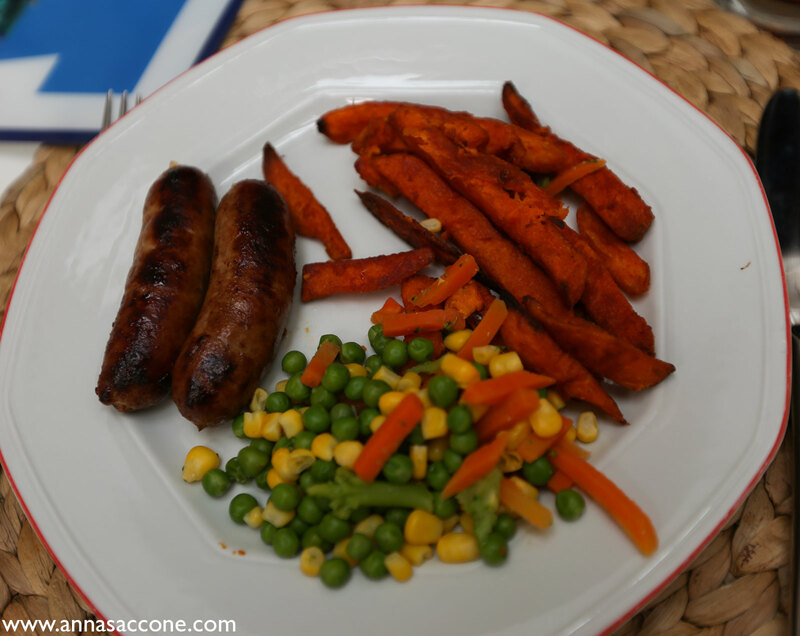 For dinner I made free-range sausages with sweet potato fries and some garden veggies (peas, corn, carrots, broccoli). It was very simple & easy using up what we had left in the freezer! I also was a bit naughty and had a glass of Diet Coke. Jonathan had bought himself beer over the weekend & I don't drink alcohol so I requested Diet Coke and had some left over :) But I did drink another pint of water after to make up for it! 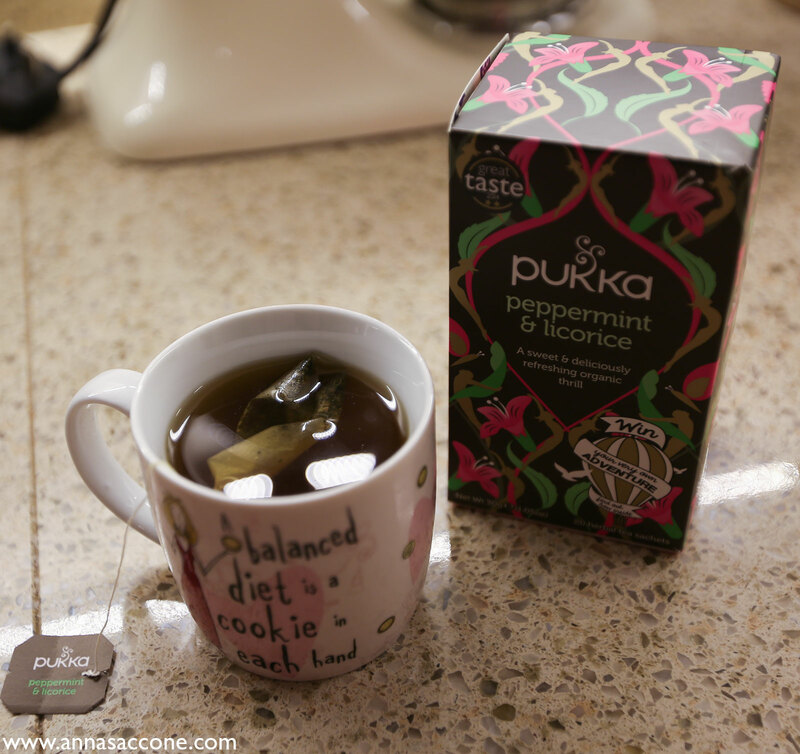 Before bed I had a cup of this Pukka Peppermint & Licorice tea which is SO GOOD! It's really sweet and refreshing at the same time, plus it's caffeine free so it's perfect for evenings to replace my usual coffee. That's everything I ate! Be sure to check out my video of What I Ate Wednesday below and I hope you all enjoyed! What did you eat today? Your meals always look so appetizing even though I don't eat porridge. The poppy seed bread looks amazing and I have always wanted to try it and seeing your sandwich makes me want to try it even more. 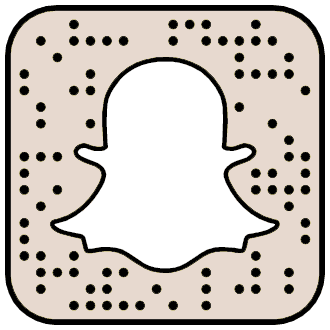 Thanks for your awesome blog and sharing it with us. I just watched your video and I have to say I love your what I ate Wednesdays! It is because of you that I started having oatmeal a few mornings a week. I really like it! For an Argentine in Buenos Aires, an Irish porridge is way different from what we usually have (coffee and toast). Great news to hear that we are lucky enough to have one video every weekday from you! 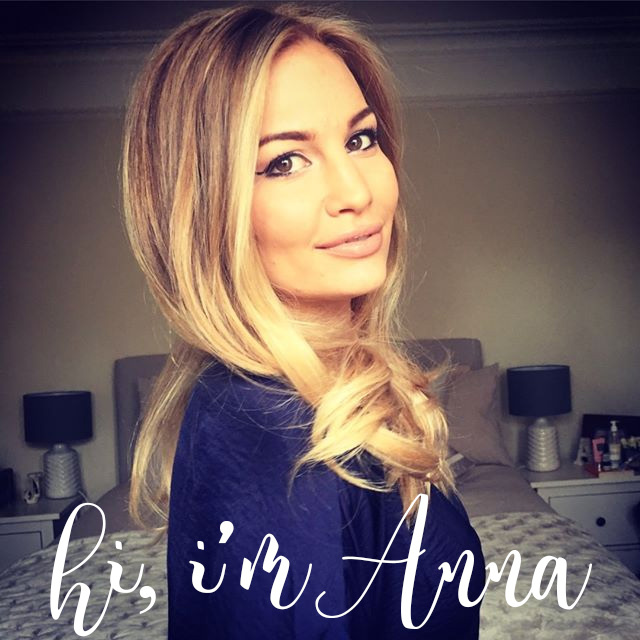 So happy to have 'What I ate Wednesday' back Anna! I love reading about what other people are eating. Those cupcakes look amazing! Can't remember the last time you did one of these posts! Glad to see them back! I love sweet potato fries and am trying to have them over regular fries now! I'm a huge fan of Pukka too, they have such an extensive range, their detox tea is particularly good! P.S. You have an adorable family Anna, your vlogs always cheer me up after a rough day! That poppy seed roll...YUM. Looking at food posts is always a bit dangerous when pregnant, 'cause then I crave everything! Glad to have 'what I ate wednesday' back! Loved your post as well as the vlog! Everything looks devine and is making me very hungry!! Your meals looks very tasty, and here i am eating a bag of chips. Very healthy i know. I actually have only found your blog, and i've been reading lots of it. Have a great day anna! I love watching your family vlogs, its super interesting watching snippets of your life and now that you're back into making youtube videos it gives us more of an insight into your life as well. Anyway, keep up the good work, you're an amazing woman! I love your what I ate Wednesdays! It helps inspire me and to help me choose new and different dishes! Have a great day Anna! Cant wait for your next post!